Do you ever feel a bit invisible? I often do. I think quite a few people do every now and then. The ability to become invisible requires a degree of skill, whether that be taught and/or naturally acquired. I would particularly consider it a special skill in the case of Kuroko Tetsuya, of Kuroko no Basuke fame. Kuroko no Basuke is a manga and anime series about basketball players, Kuroko is best known as the phantom sixth man on the basketball court. He’s the one no one notices. 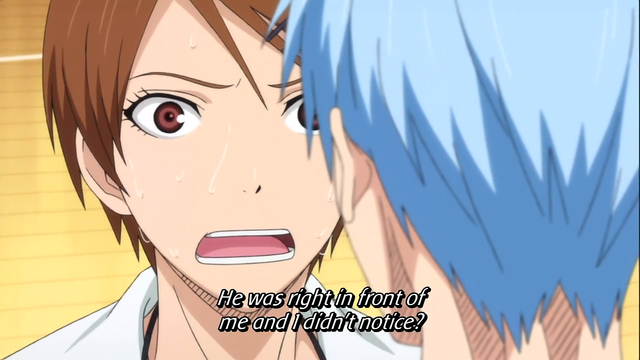 Kuroko is basically my idol when it comes to misdirection. He’s the willing shadow who helps others shine brighter in contrast. His power is the ability to make people’s eyes pass over him as if he weren’t there at all. He lacks presence. For me, personally, the idea I lack presence has been difficult to accept and it has caused many an awkward situation. For example, last year everyone in my class was meant to do a presentation. I prepared my work, practised my lines and generally freaked out about the whole thing. But I needn’t have worried. My teacher basically forgot I existed. He read through the list of people (I should have been the third person) and everyone was called up to do a presentation but me. He even ended the lesson early after looking round the room and saying ‘Well, you have all done a presentation now.’ It was very awkward. None of my fellow students seemed to notice I hadn’t done a presentation either. I didn’t know whether to tell the teacher that I’d been forgotten or not. I didn’t enjoy the idea of presenting, but if I didn’t do the presentation then all my stress and preparation would be for nothing. I sat in my seat thinking about all of these things and before I knew it everyone was packing their bags and leaving the room. Lacking presence can be disheartening but it can be put to good use. If anything I want to be more like Kuroko. I want to accept my powers of invisibility and do something positive with it. When you’ve got a skill you might as well channel it in some way. I like how Kuroko uses his lack of presence for his own ends. He has taken an element of his character and made it work in a positive way rather than feel constantly negative about it. He wants to lack presence and that is okay. I don’t really mind people not noticing me. My close friends know I am there and that is enough. I don’twant to be the person in the spotlight and I never have. I also don’t mind being the shadow that aids someone who does want to be in the light. Kuroko is a hard worker and a team player. He is a great example of how you don’t have to be the light in the room in order to be a valuable person and do something for those around you. Most of the time, I am invisible. It is part of who I am and I’m okay with that.